In a candid conversation with Social Samosa, Shruti Arjun Anand takes us through her vlogging journey with lots of tips. 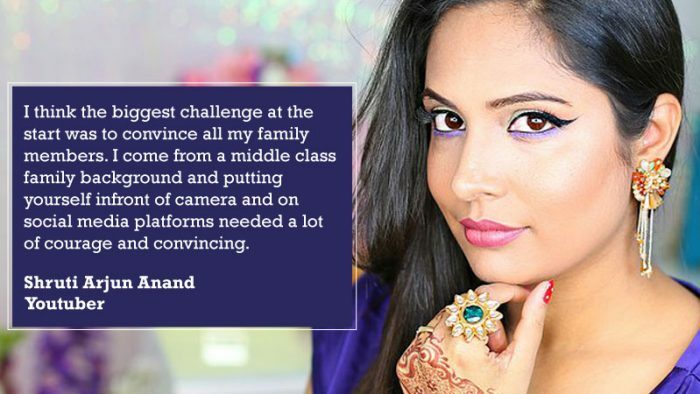 With 767k subscribers, Shruti Arjun Anand, has managed to etch her name in the list of promising vloggers. With affordable fashion and styling tips, Anand shares how her upbringing in a middle class family is actually her biggest strength. Shruti Arjun Anand has a lot to offer, as she offers tips and learning basis the adventurous ride she has taken. Looking back what was the one moment that led you to starting your YouTube channel? Out of several reasons that prompted me to start my YouTube channel was a need to communicate to other people and make friends as I was all alone in a totally new country just after getting married. Which were the biggest challenges that you had to overcome when you started off? I think the biggest challenge at the start was to convince all my family members. I come from a middle class family background and putting yourself infront of camera and on social media platforms needed a lot of courage and convincing. Arjun was always supportive of whatever I decided in my career but for my parents and in-laws it took some time until they realize and fully understood what I was doing. Fashion and lifestyle are a rather cluttered segment. What is the one thing that gives you edge over your competitors? It’s a difficult question to answer but I believe the reason why I might be having an edge over my competitors is because I am natural in my videos. Fashion has no limit but again being born and brought up in middle class family naturally pushes me to be more affordable and economical fashion, which I believe click with my viewers. It depends on what type of blog you are trying to create. If you are talking about fashion then it starts with identifying what is trending first, then I do a lot of research on how to shoot driving inspiration as I do tend to create lookbook with a lot of effects and editing to make it beautiful. In case of makeup – it all get driven by whats trending by celebrities and also on what viewers are requesting. How do you monetise your blog? Do you work with brands often? YouTube AdSense is the most stable recurring source of revenue. I do brand engagements occasionally as well but I tend to keep them limited so that I can have the flexibility of creating the content which I want to create. What are the alternate monetisation methods you would suggest to upcoming bloggers? There are so many type of bloggers that it might be difficult to generalize, but for beauty bloggers, especially if you are 100% committed to it than it might be good to start rendering your makeup/beauty services to build an additional source of income. There are lot of things going on as of now, Arjun and I are spending a lot of time these days trying to figure out what should be our next goal but nothing concrete yet. What will be your tips to YouTubers who are striving to start up? Be honest, be creative, be yourself. Always remember, people subscribe to you because they want to see you; so, if you try to be someone else in your videos than sooner or later you’ll lose connect with your viewers.